As the world transitioned from the year 1999 to the year 2000, there was no shortage of persons of religion and religious organization who made predictions they felt were bible-based which have gone unfulfilled. Such as the “Rapture; The Second Coming of Christ; Christ’s Millennium; the Descent of New Jerusalem from Heaven; the revelation of the identity of the Antichrist; the establishment of God’s kingdom and so forth. What seems to be the problem? Why are so many bible-based predictions being made and when the time arrives for their expected fulfillment, nothing happens? Are persons of faith and religious organization barking up the wrong tree? Should they be engaging in time-prophecies? What do the Scriptures say in this regard. An organization that I was associated with for many years – The Watch Tower Bible and Tract Society – predicted that the year 1975 would usher in the new order; that is, the arrival of God’s kingdom. Many Jehovah’s Witnesses were very excited and zealous in their preaching work as they believed that their relief was finally approaching. Many had cashed in insurance policies; some had foregone seeking medical attention for serious ailments because they believed that at the arrival of the new order, they would be restored to perfect health. Well, the year 1975 came and went and many Jehovah’s Witnesses were left bewildered and confused. Some had even left the Watch Tower organization with their faith adversely affected. Yet, this organization and others continue to establish dates for prophetic events mentioned in Scripture. One date that the Watch Tower organization is wedded to and almost all of their beliefs hinge on is the year 1914. It is in the fall of 1914 that the Watch Tower organization teaches that the Appointed Times of the Nations (Gentile Times) ended. It is in the year 1914 that the organization teaches that Jesus was installed as King in the heavens and has turned his attention to the earth (his Parousia). It also teaches that the 1914 generation will not pass away before the end comes. Well, we are in the year 2010 and persons born in that year would be in their late 90’s. I know that this 1914 date is making the Watch Tower organization leadership at the top very nervous. Why is that? Because that 1914 generation has exceeded the normal life expectancy of a person and members of that generation are quickly dying off. What the Society believes is the preaching of “The Good News of the Kingdom” really has not been preached everywhere in the world – not even close. Additionally, there are other things Jesus spoke of in Matthew Chapter 24 that has not yet had fulfillment such as The Great Tribulation. One can see a very subtle shift in Watch Tower thinking in this regard. Awake! is for the enlightenment of the entire family. It shows how to cope with today’s problems. It reports the news, tells about many lands, examines religion and science. But it does more. It probes beneath the surface and points to the real meaning behind current events, yet it always stays politically neutral and does not exalt one race above another. Most important, this magazine builds confidence in the Creator’s promise of a peaceful and secure new world before the generation of the events of 1914 passes away. Awake! is for the enlightenment of the entire family. It shows how to cope with today’s problems. It reports the news, tells about many lands, examines religion and science. But it does more. It probes beneath the surface and points to the real meaning behind current events, yet it always stays politically neutral and does not exalt one race above another. Most important, this magazine builds confidence in the Creator’s promise of a peaceful and secure new world that is about to replace the present wicked, lawless system of things. Notice that all reference to the date 1914 has been removed. Why is that and why should this be of interest and concern to all servants of Jehovah? Because what millions believe within the Watch Tower Organization concerning the “End of the Gentile Times; Christ Being Enthroned As King; The Second Parousia of Christ; and other prophetic events hinge on the accuracy of this date. However, if the Watch Tower Organization is in error, then it’s membership is in very big trouble because the error completely shatters a seemingly unmovable and important belief that will leave many of them confused and their faith affected as it was back in the year 1975 when it was believed that the world would end at that time. If the Watch Tower Organization is wrong, then the time table of the prophetic events taught by them and appearing in their many publications in the homes of millions are severely skewed or not true at all. For example – and for the sake of kind argument – let us assume that the 1914 date is not the correct date in which the Gentile Times Ended or the Second Parousia of Christ occurred. Suppose those events are yet future? That would mean that “The Appointed Times of the Nations” has not ended either; that Christ has not yet been enthroned as king; and that his parousia has not occurred yet. Here is a fact that many Jehovah’s Witnesses are not aware of: Beginning back in 1873, a man by the name of Nelson H. Barbour – a Second Adventist – began to publish a magazine called “Herald of the Morning” in which Charles Taze Russell was an Assistant Editor. Times of the Gentiles end in 1914. Many Jehovah’s Witnesses may not attach any significance to this but they should. Here is why? Because the 1914 concept and date did not originate with the Watch Tower Bible and Tract Society. It originated with a man by the name of John Aquila Brown in 1823, twenty-nine years before C.T. Russell was born and forty-seven years before Russell started his Bible study group. In 1818, a man by the name of William Miller – a New England Baptist and self-proclaimed end time prophet – predicted the return of Christ in 1843-1844. When his predicted dates failed to occur, he quit the movement. Another member of the Millerite movement, Ellen G. White, left the movement of 1844 in disappointment and founded the Second Adventist movement (Today they are known as the Seventh-Day Adventist). In 1869 a young Charles Taze Russell – who has raised a Presbyterian and was a member of the Congregational Church – attended meetings by Jonas Wendell, Second Adventist preacher, after which he led a Bible study class that evolved into a separate movement. Russell was heavily influenced by Second Adventists George Stetson and George Storrs in three-year relationship. In January of 1876, C.T. Russell allied with Second Adventists Nelson H. Barbour and J.H. Paton. Nelson H. Barbour, a Second Adventist, after teaching that the earth would burn up in 1874, became main author” of 1877 end time prophetic book, “Three Worlds” paid for and co-published by C.T. Russell, in which, Barbour now asserted that date (1874) to mark Christ’s invisible return in 1874 and the “day of wrath” in AD 1914. Charles Taze Russell – the founder and first Watch Tower president – broke away from Barbour and his Second Advent mentors in 1879 to publish his own journal, Zion’s Watch Tower and Herald of Christ’s Presence. (Today this magazine is called The Watchtower). 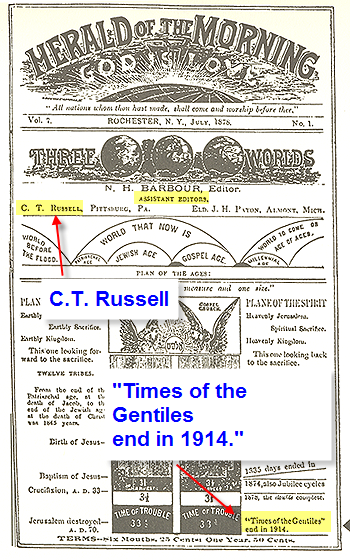 Russell enlarged on the proof of the end time date of 1914 by lengthy argumentation in his books (Studies in the Scriptures Volumes 1 through 6) and the Watch Tower magazine from 1879 until his death in 1916. Russell became “Pastor” to an increasing group of supporters called “Bible Student’s” today known as Jehovah’s Witnesses. In 1993, the Watch Tower published a book entitled “Jehovah’s Witnesses – Proclaimers of God’s Kingdom.” This publication was an attempt to present a history of the Watch Tower organization. What is missing from the publication is that the Second Adventist movement was the source of many of Charles Taze Russell’s teachings; including the 1914 date. In fact, almost none – if any – of Charles Taze Russell’s publications appear in the Watch Tower library today. Another fact is if Russell was alive today and spoke as he did when he founded the Watch Tower, he would be viewed as an “apostate” by the very organization he founded. Today, most Jehovah’s Witnesses are left with the impression that most of these teachings and the date 1914 originated with Russell and that he and his Watch Tower magazine constituted a unique divine channel for the revealing of previously lost or unknown truths. I want the reader to understand that I have no problem with Jehovah’s Witnesses (or members of any religious organization). In fact, I find most Jehovah’s Witnesses to be polite, kind, and considerate. Their zeal is to be commended. That is is not the issue. The issue and question are who one should listen to? An “organization” or to The Son of God? In the above Scriptures we can see that the knowing of times and dates are in the jurisdiction of the Father only. We are not to establish dates, we are to keep on the watch. The point that should be carefully noted about this Evil Slave, is that he is the one who would say in his heart that his master is delaying. That this Evil Slave would be think that there is a delay, implies that he was expecting his master to return on a certain date or within a certain time frame. Is this not what the 1914 date – or any time prophecy date – does? The Watch Tower Bible and Tract Society has not done this. They have actually claimed to know when and have published the date as 1914 in spite of what Jesus said in the Scriptures quoted above. How about the other slaves – the faithful ones – within the masters household who were being beaten by the Evil Slaves, were they expecting the master to return on a certain date or season? Happy is that slave if his master on arriving finds him doing so. The masters return to his household will find the faithful slaves conducting themselves faithfully carrying out their master’s instructions. They are not concerned about the dates or time frames of their master’s return. Only an evil slave would be concerned about dates. This, in fact, shows unfaithfulness and hypocrisy. Again showing, there is no human or human agency who can know a time, date, or hour of the Master’s return. I fully understand “organizational” loyalty. I also understand the need one feels to give their loyalty to an organization especially if it claims it speaks with Jesus’ voice and that it contains the “Faithful and Discreet Slave” as mentioned at Matthew 24:45. Is he the one who deals in dates and time prophecies? Dates Jesus said cannot be known by his slaves. Or, is this slave the one who listens to their master Jesus and who faithfully carries out his instructions without regard to dates? Are those who claim that they are the “Faithful and Discreet Slaves” actually beating the innocent “Faithful” ones and not be aware that they are doing so? A few years ago, I have broken away from the Watch Tower Organization after nearly twenty years of association because I began to develop doubts over Watch Tower teaching; the 1914 date is one of them. I am now stained with the “foul stench” of “Apostate” by the Watch Tower Organization because I refuse to be “re-adjusted” in my thinking. I hold no animosity for the organization whatsoever. I simply feel – as a matter of conscience – that I must listen to Jesus rather than to religious organization. It becomes a dangerous thing for any of us to allow men, women, or religious organization to demand or intimidate us so that we listen to them rather than to the one Jehovah said we are to listen to His Son and our Master, Jesus Christ. Religious organization of all sorts is not a good thing. We must open our eyes to see who or what is standing in front of us. It had better be God’s Son as he is the only Mediator between God and men. Jehovah placed him in this holy position. If any human or human agency on earth today is standing in this position before us, then it is standing in a place where it does not belong. Jehovah did not place them there. Jehovah did not make them Mediator between Himself and men. Neither as Jehovah authorized them to usurp to themselves slaves that belong only to Jesus. No human or human agency has been authorized to beat slaves that do not belong to them. These beatings coming in the form of fearfully and unfairly disciplining and labeling as “Apostate” all who do not adhere to or conform to “organizational” mandates and programs. If what the Watch Tower Organization (or any organization) feel that what it teaches is true, then why prevent its membership from listening to anyone who does not hold to its views. Does not truth have the strength to confront error? When in the “Field Service” arrangement do not Jehovah’s Witnesses encounter all sorts in the field? Are they not listened to? Do Jehovah’s Witnesses expect only a “one-way” communication? How can anyone expect to be heard if they, in turn, do not listen? That includes all expressions from any source. Do those expressions originate with God? Did the 1914 date originate with Charles Taze Russell? Is it supported in Scripture? Should any of Jehovah’s servants and followers of His Son be engaged in dates and time prophecies? Hopefully, the information I have provided will assist one in realizing that something very amiss. Jesus did not command his followers to establish a system of religion and give it a name Christianity and make for it an image called the Bible. Men ordered these things. Jesus’ call was to discipleship and attachment (membership) to himself – a person – and not to religious organizations that tell you that they speak for him. If that is the case then The Son of God no longer lives if he needs a stand-in. But that is not the case; he lives and presents himself as the way, the truth, and the life. He, not religious organization, is the only way to come to the Creator and Father. Yet, the believing world is largely corralled within the guarded walls of religious organization thinking this is where God and Christ told them to go and attach themselves to. They have allowed themselves to be taken captive again and are not slaves of their true Master, but of religious organization. The Apostle Paul at Hebrews 13:12-14 shows that there does not exist for true followers of Christ any city-like (organization) entity in which to go. He gives the answer why? Because our Lord suffered and was impaled outside of such a thing. He was never around long enough to establish such a city, that not being his mission anyway. Another reason Paul gives is because such a city has not arrived yet and we await its coming. Therefore, Paul says that we are not to go into something but to go out to where our Lord is. Where? Outside the camp. The Son of God does not exist inside any religious system or organization today. The ensnarement and enslavement of the masses by religious organization is for the purpose of controlling them to teach them to speak, think and walk as the organization wants them to. The mind of the individual is usurped and taken over. He does not think for himself. To do so is going against the organizational arrangement. Honest-hearted Jehovah’s Witnesses know that this is true. If one is not with the Watch Tower program and in lock-step with its teachings, meeting attendance, Field Service arrangements, or even questions and challenges any of the teachings, they know they face disfellowshipment if adjustments are not made in their thinking. Every Jehovah’s Witness knows that the thinking and reasoning faculty has been done for them. For instance, in a typical Watchtower magazine study, the article is read, the question is carefully crafted, and the answer is read from within the article itself. More experienced Jehovah’s Witnesses can put it in their own words but that is all it is, paraphrasing what is in the article. This is the pattern with all study publications. There is no true research conducted by the individual Witness as it is all laid out for them. It is a matter of studying what has already been prepared. To question or challenge what has been prepared will liken the person to one who is unfaithful, rebellious, or apostate. The meetings themselves do not allow free expression of thought. Any expressions freely made had better be within the boundaries set by Watch Tower teaching. Witnesses are told exactly what to say at the householder door, told what they are not permitted to read and even speak to. There exist a grooming standard that presents a false image of cleanliness. A bearded person is silently frowned upon and will never be seen as an Elder or Ministerial Servant or in any of the publications. As a person of African descent, there is a strong Anglo-European image that is maintained. We see this even in the images of Jesus portrayed in the publications. This is a possession, a possession of the individual person, his mind, and his conscience. This is what all religious organizations do; this is not unique to the Watch Tower organization. Sadly, once religious organization grabs hold of you, you are subtly made to listen to them and what they teach. The organization takes on a life of it’s own and one finds themselves even in conversation using expressions such as the organization and in the truth far more many times than Jesus’ name or even Jehovah’s name itself. Listen to who Jehovah says we are to listen to means obeying and responding to Jesus’ call at John 8:31-32 to become his disciples, not disciples systems of religion with their many contending organizations. Pray incessantly to the Father in the only way possible and that is through His Son. Ask for His wisdom, knowledge, and understanding. It is not through a book that you will receive them. Did you ask for them through a book? No, you ask in the name of Jesus; and it through this same one you will receive those things. One deceives themselves if they think that the Bible is the Word of God and it is through this book God provides wisdom, knowledge, and understanding. No book can contain all of Gods wisdom and knowledge. Only His Son is The Word of God and it is only through him that we can receive such things from God. Those who do not grasp this shortchange themselves in a large way as there is a vast wealth of wisdom, knowledge, and understanding that can be had via prayer to the Father through His Son.